South Korea has a new Prime Minister. You can call her Ms.
A feminist and former political dissident was picked to become South Korea's first woman prime minister. Roh Moo-Hyun, a move hailed as a step forward for women in male-dominated South Korea. The prime minister heads the cabinet and is second only to the president in power under South Korea's constitution. I particularly liked this little item in the story. Now this is how its supposed to work. A transit strike seems a little less of a disaster than a hurricane, don't ya think? 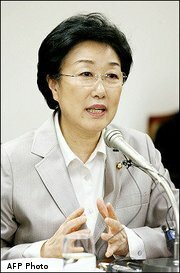 The post of prime minister was vacated last week by Lee Hae-Chan, who stepped down in disgrace after apologizing for playing golf on the first day of a crippling national railway strike. Both Ms Myung-Sook and her husband, a university professor, have been jailed in the past for their pro-democracy work.